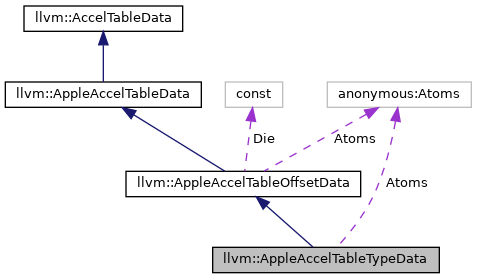 Accelerator table data implementation for Apple type accelerator tables. Definition at line 348 of file AccelTable.h. Definition at line 350 of file AccelTable.h. Definition at line 600 of file AccelTable.cpp. References llvm::AsmPrinter::emitInt16(), llvm::AsmPrinter::emitInt32(), and llvm::AsmPrinter::emitInt8(). Definition at line 716 of file AccelTable.cpp. Definition at line 356 of file AccelTable.h.